Electricwest's debut release on Boltfish offers 13 tracks of superb electronica. The original enhanced CD also contained 2 videos in Quicktime format, for the haunting 'Insavior' and dub-influenced 'Pull The Drapes'. Both are now available online, one visible in the 'media' tab of this page. "A brilliant debut album by an artist called Electricwest (the parents most likely would be calling Pat Benolkin for dinner) released by Boltfish Recordings. The mood is set straight away in the opening track The Nightshift with slow but reliable hip hop beats laying the foundation pared with atmosphere setting synthetic sounds and warm subbass creating a great track. Crispiness is the option in Wearing Crimson that follows, beat remains steady nevertheless and in the same time demonstrating the strength of leaving some air in the production using breaks in a clever way. The use of glitch is contrasting in a beautiful way and it’s enjoyable. Third track Niche is devoid of beats and is remarkably well produced drone influenced with melancholy executed in a flawless matter, there’s just one criticism and that would be the song’s actual playing time - it is too short. The remedy? Hit the replay button and don’t delay. And that is actually the feeling I get throughout listening to this album. It is filled with crispiness and detail and many of the songs included on it simple demand a second (immediate) listen. A great debut album and another accomplished release by the fellowship of Boltfish..."
"This debut release was issued by a UK label Boltfish Recordings, which is mainly focused on releasing IDM, Glitch and generally speaking electronic music of different kinds. In my opinion the album cover reflects really well the mood we’re going to be surrounded once we push "play" button on the hi-fi. On the one hand this release can be characterised as urban: while listening to the album you can hear a slight whisper of a crowd, people in a hurry crossing the street, traffic jam, electricity travelling through the wires, neon signs on the skyshapers around, making you feel tiny and insignificant, tell you their own stories...You don’t hear exactly those sounds, nope. All your ears get is an organic mix of clicks, small, almost unheard, noises and relaxing rhythm structures. But your mind, your imagination build the picture itself, based on this mix of noises your ears perceive. Dynamic, ever moving city, night city. Here go such tracks as The Nightshift, Visiting Hour, The North End and Terrace Air. And on the other hand there’s a feeling of still atmosphere, as nothing changes, everything is in the same state, which is reflected in the upper part of the cover pic. The tracks to be mentioned here are Wearing Thin Crimson, Niche (especially). With this feeling comes another one – a feeling of being outside the busy city sinking in its problems and routine, witnessing from outside, without taking part, being in the nature surrounded by a few trees, shaking in the wind, and looking at the far away skyshapers illuminated with electricity and creating an unreal picture. I’d mention the last 2 tracks here – Goodbye and Between Us. Also I can’t help mentioning the track called Today, where some samples from "Requiem for a Dream" movie are used (the talk of two main characters on the phone). Although the moment in the movie is very dramatic here this sample is used with another purpose, it seems. It gives the track deep, a bit dreamy, unreal atmosphere, some mystery together with the sound of falling rain. Videos by Jason Willford that are present on the CD are somehow strange. Short and rather ambient Insavior video shows us car tests and the results of the crashes performed on dummies. The name of the track seems to look as a negation of the word "savior" and probably the video has some sense within this concept. Perhaps the accent was done on the fact that air bags are not as efficient as they are considered to be. The second video – Pull the Drapes kind of opens the curtains to the interaction of the nature and human,presented the form of industry, and the kind of feedback the human, being a part of nature, gets in a result. However, one of the sides art has – the difference of perception depending on a person. Overall this album is a fine one to relax after the long working day and at the same time it may be listened to as a background to some activity (mental, for example) – ears don’t get tired, the album can be easily listened to over and over and you keep on exploring the soundscapes with each next turn. Personally I am very curious about Pat Benolkin’s next works." "DJ and self-taught musician Pat Benolkin has created a dreamy ambient set of twelve tracks that while brooding, also have a cinematic majesty ot them that gives them a bounce. This is the soundtrack for a 3am cab ride and a buzz that lead to too many past memories. This is great music for talking to yourself, and haunting yourself. "Wearing Thin Crimson" and "the North End" pulse with urban visual life, and even the more resigned tracks like "Pull The Drapes" and "Goodbye(Glance Back)" have strength of resolve and hope in the beats. This is music to play when words are pointless, but you need to know you are not alone"
"Idaho-based Pat Benolkin, with this Boltfish debut as Electricwest, shows himself to be one of the more promising additions to the label’s lately expanding ambient-electronica roster. In fact, it’s a more downtempo, one might even venture "chilled" (though not, heaven forbid, "chillout") release, than other recent Boltfish output, with a nice line in crepuscular atmospheres and slightly tenebrous (though never gloomy) textures. Benolkin’s previous work has been under the alias Eluder, with a low-profile release, Warm Warning, traces of whose appealingly narcotized ambience, bespeckled and veiled, is also in evidence here. Those seeking sonic reference points will reach to hang out the customary facile "Boards," but to be fair that tag has been lazily stuck on many others seeking to operate in this populous area where psychedelic atmospheres and "weathered" textures are combined with carefully sculpted beats and driven towards the melancholy and the reflective. Some have been around longer and made a bigger name, but no one has a monopoly. One might more accurately relate Benolkin’s sensibility to that of a nearer peer, Milieu, another musician who switches with equal facility between IDM and beatless ambient modes. Both evidently share a liking for hitching scuffed environmentally-infused ambience to low-key broken-beat drum-derivations. 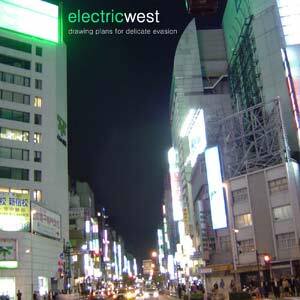 Electric West as a sonic concept does not vary greatly in tonal spirit throughout, tending to work with understated low-attack pads, gauzy or occluded, often underpinned by pronounced dub-infused bass lines. A bleary-eyed "all passion spent" sound predominates, though it’s somehow not weary or wearisome. The presence of carefully assembled beat structures helps to lift and carry proceedings when they risk encroaching on the over-solemn ("Visiting Hour"), assisted elsewhere by sparing infusions of shimmering and glimmering timbres. At best, on "The North End," Benolkin shows himself capable of rivalling the delicately orchestrated pastoral balladic beauty of er... those Scots blokes. "Pull The Drapes," another highlight, draws you into a downcast dub daze that remains strangely diverting where in the hands of others it would be dispiriting. Overall, Drawing Plans For Delicate Evasion achieves the considerable feat of putting the outside world on hold for its 48-minute duration, lulling the listener into a sense of stunned security. It’s a tribute to Benolkin’s meticulous production that this deliberately undynamic, slight material can be as seductive and enfolding as it turns out to be. A case of the whole transcending its parts to become something far more." "By adding welcome grit and grime to Boltfish's typically pristine sonic aesthetic, Electricwest's (Pat Benolkin) Drawing Plans For Delicate Evasion expands the label's stylistic terrain even further. Not only are the album's tracks drenched in textures, there's a stronger hip-hop dimension in the songs' rhythms (clip-hop stylings of "Visiting Hour" and "Firefly Eyes" even hint at Dabrye). It's hardly a beat-based affair, however; instead, it's more ambient than Boltfish releases tend to be, and beats are included on most tracks as one element of many. Soothing melodies still unfurl with elegance at the music's core, but they're now embedded within a thick web of ambient detail; note, for example, how lusciously the bass drum's thud pierces the atmospheric haze and willowy melodies in "Wearing Thin Crimson." Throughout the disc, Benolkin filters his material—the three beatless interludes especially—through a thick scrim of granular static. With its relatively cleaner production style, electric guitars, and clicking beats, "The North End" deviates from the album's general template—both the title and the ambient guitar style evokes Manual—though not displeasingly so, while voice samples provide a more concrete expression of atmosphere, romantic longing specifically, in "Today." The thirteen-track collection is remarkably assured, and even more so for being Benolkin's Boltfish debut. (The enhanced CD also contains two Quicktime videos for the experimental interlude "Insavior" and "Pull the Drapes.")" "Electricwest has provided another gem in Boltfish's increasingly essential line-up of Electronica releases. I'm not familiar with the name, but no matter, the music on offer here speaks for itself in a big way. Possibly the most relaxed and textural sounding works from the label thus far, it shows a real willingness to move within the sphere of electronic music, never pigeonholing themselves with one particular type of sound. Deep, luscious and understated swell and pads are the keys here, to which Electricwest adds subtle, low-key rhythmic elements and delightfully mellow melodic shimmers and sparkles. You'll fall for this one in no time at all, just as we here at the Fish did. Comes recommended most highly." "The man behind Electricwest is one Pat Benolkin from Idaho, USA. He has been playing music since 1997, first as a DJ and since 2001 as a musician. As Eluder he plays 'lush, melodic ambient music', but I must say that Electric West already sounds pretty ambient to me. A hotbed of synthesizers lay down a carpet of thick warm sounds, and on top the rhythm ticks away in loneliness the bars. Between those two ends, there is a likewise lonely bass that thumps and stumps, but everything goes in a very laidback mode. Hurry doesn't exactly exist in the Electric West. His music is like driving to a large but empty town, late at night, with lights flickering everywhere but all of this at a very slow speed. Still no hurry to get anywhere. Even when it's all relaxing, Electric West doesn't put the listener to sleep, he puts the listener in a trance like state - one of never wanting to sleep or wake up again. It's very nice music, but at the same it's of course not something that has been entirely new or fresh. But it's quite alright, altogether."